Is the world’s heart changing? 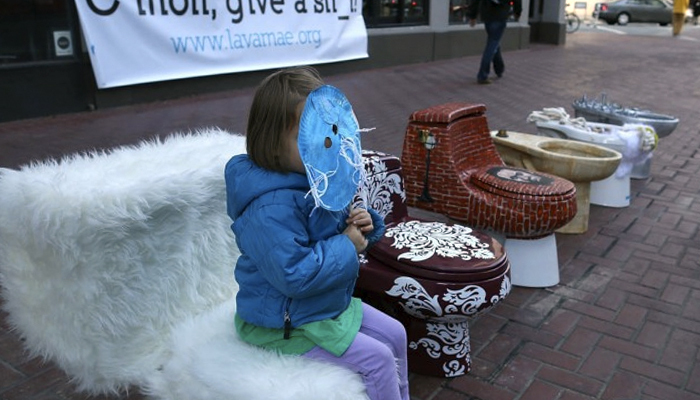 In celebration of World Toilet Day, decorated toilets are displayed on a sidewalk in San Francisco. This public display of this normally private fixture is an effort to raise awareness that millions of people around the world, who do not have access to clean and private toilets. The display is also an effort to bring attention to a project to convert retired MUNI buses into mobile showers for the homeless. The Pope traditionally washes the feet of the poor on the day before Good Friday. But now the Vatican has unveiled plans to offer bathrooms to the poor all year round. Rome’s homeless will soon be able to shower in the shadow of St. Peter’s Basilica. When our future grandchildren look back on our age, they will see it as dull and grey, dominated by technology and neglecting human values. They will understand that we today could not yet free ourselves from our narrow focus on work, which we viewed simply as a means to pay for consumable goods and leisure pursuits. They may, however, wonder what it was like to live at a time when life was divided into little boxes of either work or leisure. They will also think of us today as being poor. Historically, the production of material wealth has increased at the rate of about 20% to 25% per decade, and this trend must be expected to continue. This implies that our grandchildren will likely consume twice as much as we do. The huge increase in material wealth owes much to science and technology, but, in the future, attention will turn away from science toward non-materialistic and non-scientific values. Oxfam the charity reports earlier this year at Davos’ World Economic Summit on the growing inequality driven by 'power grab'. The world's wealthiest people aren't known for travelling by bus, but if they fancied a change of scene then the richest 85 people on the globe – who between them control as much wealth as the poorest half of the global population put together – could squeeze onto a single double-decker. The World’s heart is changing faster than most of us realize. Most would agree something has to be done, but many are not sure how. Three showers are going up near St. Peter's, is it a gesture or a real start?